Sapphire and diamond white gold stud earrings. Showcasing a pair of cushion-shaped blue sapphires weighing approximately 1.58 carats, within a conforming border of round brilliant-cut diamonds all together totaling approximately 0.53 carat, approximately H color and VS clarity, mounted in 18-karat white gold. We love that these sapphire and diamond stud earrings are the perfect pair of earrings for wearing every day, going anywhere, everywhere, any time of day or night! We also love that the sapphires have a very pretty color that stands out beautifully with the help of the sparkling diamonds. 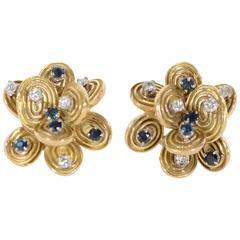 They have the right amount of everything necessary to become “that perfect pair of earrings.” Very pristine condition consistent with age and wear. Celebrate Yourself and Your very discriminating taste with these sparkling blue and white baubles as Your personal luxury treat to Yourself, today. Make Yourself Happy. And if that won’t be the case, imagine how Happy You will make that special woman in Your life by gifting these special sapphire and diamond stud earrings as a token of Your loving care and affection. Imagine the surprise and all the pleasure that owning them will bring. For over thirty-five years, we have been in the business of making people Happy by selling a carefully curated collection of antique and estate jewelry. We believe that these innocent, luxury indulgences have the potential of becoming tomorrow’s cherished heirlooms and that is what it is all about, from our good taste to yours. Cheers! MEASUREMENTS: approximately 3/8” by 3/8” (9 mm by 9mm) overall with large, clutch friction backs.